You probably got here from Latrice Murphy but if you got lost, head over to the Paper Issues blog to start! Tombow USA were very generous and gave the Paper Issues team an amazing assortment of adhesives to use on our projects: Tombow Mono Adhesive Permanent, NEW Tombow Adhesive Dots, Tombow Mono Multi Liquid Glue and Tombow Mono Aqua Liquid Glue. For my project, I made a layout using one of my favourite photos of my husband and son. I wanted to showcase that Maggie Holme's Confetti line could be used on 'masculine' layouts and did not have to be birthday themed. I was actually surprised at how much blue and green I found in this line. 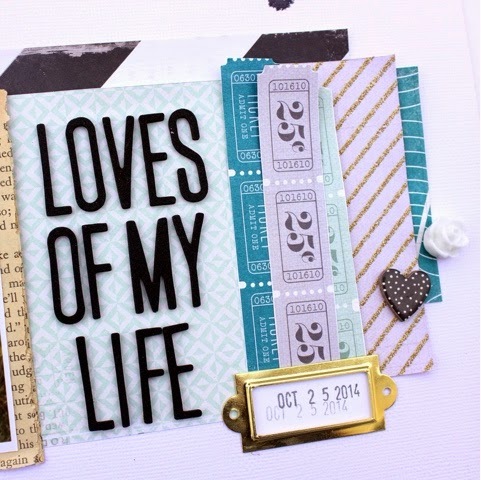 I used the Tombow Mono Adhesive Permanent to glue down all of my paper products. There was a slight learning curve with this adhesive, but once I got the hang of it, I was super impressed with how well it held everything down. It's definitely stronger than my usual tape runner. I used the NEW Tombow Adhesive Dots beneath my photo and really liked them. They were easy to use and held really well. I used the Tombow Mono Aqua Liquid Glue on all my bulky embellishments and I cannot say enough good things about this glue. I am officially a Tombow liquid glue convert. I used a few drops on on both the megal book plate and the bulky white flower and I have not had a problem with them sticking at all. I made this layout almost a month ago and I display my layouts standing up in my scrap room. Neither item has fallen off or budged at all. I was so impressed at how well this glue holds, I actually used it on a card I made months ago that has a metal embellishment that keeps falling off. I have tried a bunch of different glues on it, but the embellishment keeps falling off. I used the Tombow Mono Aqua Liquid Glue on it about a week ago and it is still holding just fine. The card is ready to be sent to someone finally! 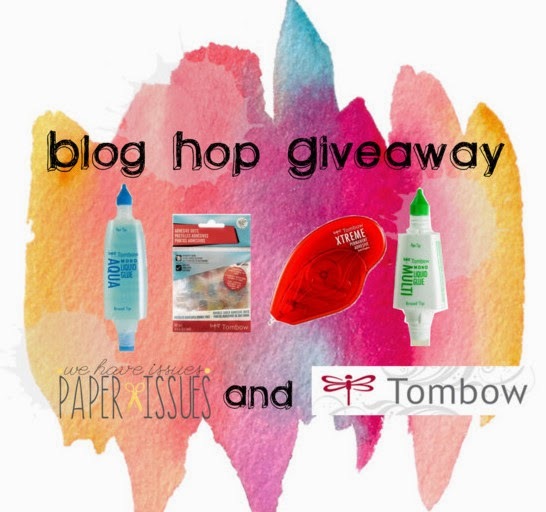 Both Tombow USA and Paper Issues are offering giveaways, so be sure to visit all of the blogs on the hop. Your next stop is the Tombow USA blog. This is beautiful Meaghan!! That picture is just precious! Wonderful layout! A great story scrapped with awesome colors and textures! TFS! Beautiful layout! I love everything about it! Beautiful layout. I love that pop of blue with all the neutrals. This is a really pretty layout. Beautiful Layout! Love the products you used! Thanks for sharing! okay. so this is beautiful - the photo is fabulous, the details are so perfect, and OMG, Huck Finn book page - YES! you're awesome, girl. love your style. awesome layout! really love this! Incredible layout! LOVE the design and all the details are amazing! GREAT job on this! TFS! Ooh I like your style lady! A strong layout for your 2 specials guys, great job! Awesome layout, memories of father and son are always precious, and making layout's keep those memories intact for days when you would like to remember the old days....... Love your layout thank you for sharing. Gorgeous page! Love all of the bits you used to add dimension and add to the story! Beautiful masculine layout! 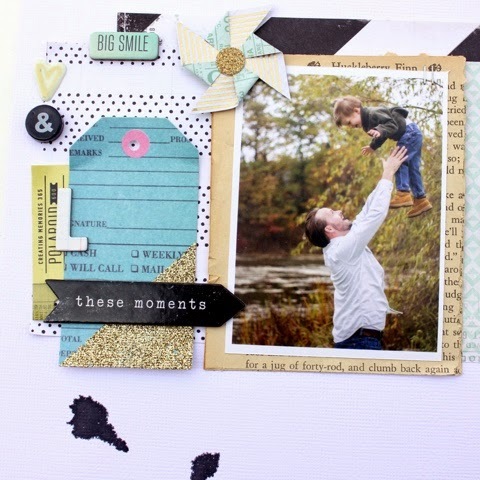 Love the way your page captured the relationship between your husband and son. I Love everything about this layout! The colors are amazing! !! plus all of the amazing swag bag elements! Absolutely gorgeous photo and layout to match! Oh, this is so sweet!! What a wonderful photo!!! Great job on the page!